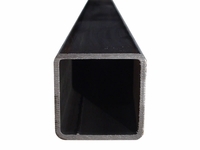 Steel square and rectangular tubing are low carbon cold formed electric resistance welded tubes. These types of tubes offer a high strength-to-weight ratio and a relatively low in cost. Steel tubes can be readily welded, drilled, formed, and punched. The outer flash has been removed and the surface finish is quite good.